Bill C-6, an Act to amend the Citizenship Act, has become law. Some changes are effective immediately, but others will be implemented in Fall of 2017. I would like to emphasize that Bill C-6 reflects the government’s commitment to fostering a diverse, fair, and inclusive country. We know from decades of experience that immigrants who become Canadian citizens are more likely to achieve greater economic success in this country, and to make greater contributions to Canadian society, thereby contributing to our common prosperity. Furthermore, we know that a significant predictor of successful integration outcomes is the attainment of Canadian citizenship. Historically, a very high proportion of newcomers to Canada have become Canadian citizens. It goes without saying that this integration not only benefits the lives of those newcomers who end up becoming new Canadians but makes our country more diverse, inclusive, and fair. Previously: you had to be physically present in Canada for 4 out of 6 years before applying for citizenship. You do not need to be physically present in Canada for a minimum number of days per year. Previously: you had to be physically present in Canada for 183 days in four out of the six years preceding your application. Days spent in Canada before becoming permanent resident (as temporary resident or protected person) count as 1/2 day. Previously: the time spent in Canada before becoming a permanent resident did not count towards the physical presence requirement for citizenship. 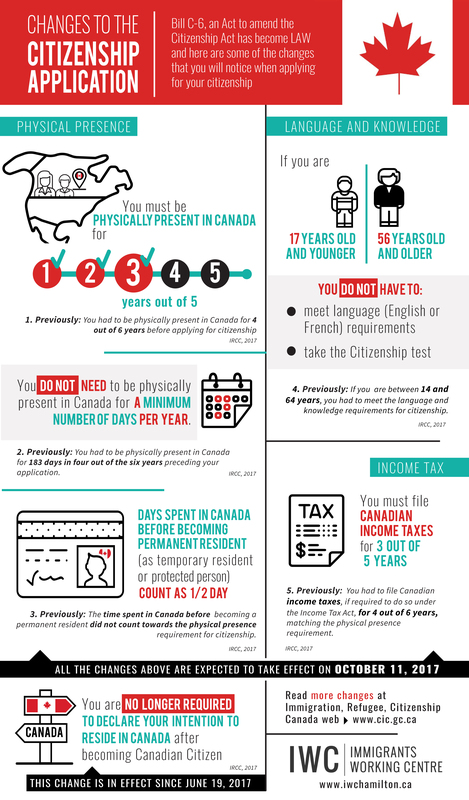 If you are 17 years old and younger or 56 years old and older you do not have to meet language (English or French) requirements nor take the citizenship test. Previously: if you are between 14 and 64 years, you had to meet the language and knowledge requirements for citizenship. You must file Canadian income taxes for 3 out of 5 years (matching the physical presence requirements). Previously: you had to file Canadian income taxes, if required to do so under the income tax act, for 4 out of 6 years, matching the physical presence requirement. *All the changes above are expected to take effect in Fall 2017 [October 11, 2017]. You are not longer required to declare your intention to reside in Canada after becoming Canadian citizenship. Previously: you were required to intend to continue to live in Canada if granted citizenship. Read more changes at Immigration, Refugee, Citizenship Canada.